In the UK we take supplies of clean, accessible water and safe sanitation for granted, but for many in Burkina Faso they are an almost unimagined luxury. It is estimated that over half the country’s population rely on unreliable and often polluted water sources, many having to walk for many hours each day just to collect water for their family. Figures also suggest that 50% of all schools in the country have no toilets for children to use. One of the greatest gifts we can give people anywhere is the gift of fresh clean water and safe sanitation. 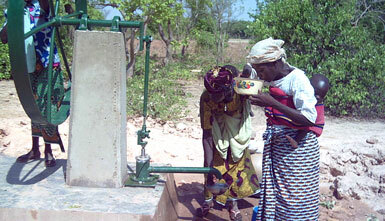 Indeed local people say ‘water is life’ in Burkina Faso. Improvements in sanitation facilities and basic hygiene can also have a dramatic effect on health, particularly amongst children. We are engaged in a major programme to improve water supplies and sanitation facilities for communities in a region in the north of Burkina Faso. Holes in the ground and Christmas gifts – our latest newsletter is out. Just a hole in the ground, for now.